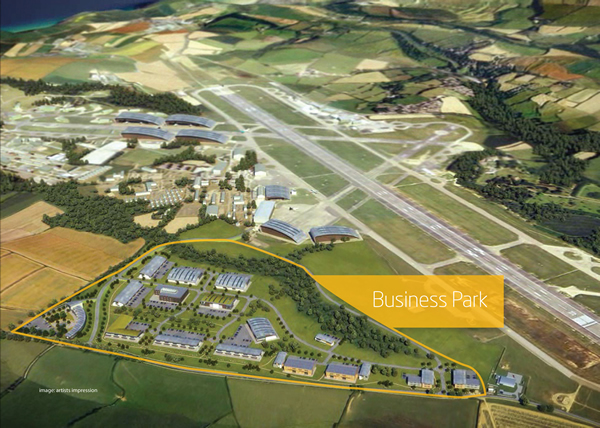 The Aerohub Enterprise Zone, directly adjacent and to the south of Cornwall Airport Newquay, addresses the lack of high quality employment space in Cornwall and the Isles of Scilly that remains a fundamental barrier to economic development and growth. The Cornwall Local Plan Employment Land Review (2010) estimates that a supply of around 150ha is needed to meet demand. Due to the economic downturn, only 7.6ha of additional workspace was delivered between 2009 and 2012, and this is only a third of what was required. The market failure linked to the creation of employment space has been exacerbated in recent years by the impact of the economic recession. The uncertainty within the investment market has had a significant impact on the stability and supply of industrial and office property. The Aerohub Enterprise Zone Business Park Phase 1 project is a development of Plot 2 of the Aerohub Business Park, creating 1,005m2 of office space and 1,904m2 of light industrial space for SMEs on a high profile, constraint free site, acting as a catalyst for the future development of the Aerohub Enterprise Zone as a whole. The plot is intended for SMEs from the Smart Specialisation sectors and those that contribute to the Enterprise Zone programme initiatives. The project will directly deliver employment space to meet demand at a key strategic site, facilitating new market opportunities and providing a catalyst for new growth at the Aerohub Business Park. The units will be built to BREEAM excellent standards, combining high environmental performance with aesthetic quality. The project will contribute to the objective of creating high wage and high skilled local employment, adding to the resilience of local communities and to the long term strength of the Cornish economy. The preferred approach will provide specific office workspace alongside light industrial units and service yards. The units have been designed to facilitate future growth through combining units for ultimate flexibility and will provide 2,909m2 work space in total.